A cosmopolitan old colonial town known to tourists throughout Europe, the holiday destination of Puerto de la Cruz is located on the north coast of Tenerife and is the principal tourist centre of the island. It was in the 1890s that Puerto de la Cruz became a fashionable spa town and since then it has been a preferred holiday spot for European royalty and dignitaries, such as Winston Churchill and Bertrand Russell. Despite its long-term popularity as a tourist destination, Puerto de la Cruz has maintained the style and flair of a cosmopolitan spa while retaining the feel of a small, friendly, and bustling Spanish town. Considered the birthplace of tourism in the Canary Islands, Puerto de la Cruz attracts some 900,000 visitors annually. The area around the old fishing port is still lined with cobbled streets, full of colonial architecture, and is one of the few resorts where locals still work, eat and drink. It is a place where old-world charm exists alongside trendy hotels and apartments, making this the perfect holiday destination. Puerto de la Cruz is a shopper's paradise and holidaymakers won't be disappointed. The 'free port status', which the island enjoys, allows imports from all over the world. There are a large variety of goods available from the many hundreds of shops, often at good prices. Electronic items of every description, photographic gear, perfumes and alcohol are especially cheap. Travellers should be aware that cheap goods can sometimes be tacky, low-quality or counterfeit. The Martianez mall is a favourite with tourists wanting to splash out on clothes, shoes and gifts. For a fine culinary experience while on holiday in Puerto de la Cruz, try La Casona, Meson los Gemelos, Regulo or La Ganania. The many restaurants in the resort offer up a variety of dishes and many different cuisines can be found. The Plaza de Charco is lined with restaurants and cafés and it is the perfect place to enjoy a meal, tapas or just a drink and watch the world go by. Holiday visitors should be sure to visit the most popular bars in Puerto de la Cruz, including Friagata, Molly Malones, Color Café and Azucar. There is, however, a wide range of bars and clubs on offer, with some staying open into the early hours of the morning. 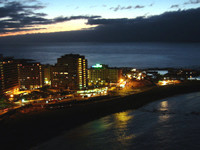 Puerto de la Cruz's nightlife is special in that it is still geared towards locals more than tourists and therefore has an authentic Spanish flavour which the purpose-built resorts usually lack. The holiday destination of Puerto de la Cruz offers some of the best tourist attractions on the island and many guided walks are available. The town is very attractive and has many historical buildings to visit, such as the Church of Nuestra Senora de la Pena and the Castillo San Felipe. Other places to see include the Loro Parque, which boasts over 200 species of parrots and other animals; the Botanical Gardens, displaying plants from Africa, South America and Australia; and for those willing to venture further afield, the volcanic landscape of the Teide National Park. In recent years muggings and other street crimes have started to become a problem. Thefts from cars, especially cars left overnight and cars left in what appear to be deserted scenic locations, have become a major problem. Travellers should not leave valuable items in an unoccupied car.